•	1 KG of small onions. •	1 cup of hot red pepper cut into small pieces. •	1 tablespoon of mustard seeds. •	1 tablespoon of non grinded coriander. •	6 cups of white vinegar. •	2 tablespoons of bees honey. •	Put onion in a boiled water for few minutes and peel it without using a knife then put it in a cool water and filter it after that. •	Boil the vinegar after adding the mustard, coriander and celery to get an additional taste then filter and set the vinegar aside. 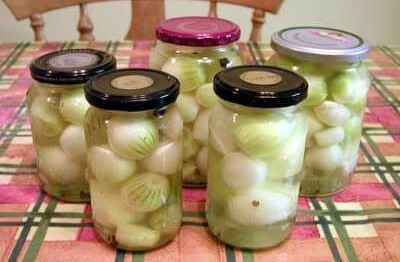 •	Put onion in a sterile jar then add cut red pepper and then cover it vinegar with leaving about 1cm empty and then close the jar well. •	Put the jar in a plate which is bigger than the jar which includes boiled water for 10 minutes to get rid of air inside the jar. 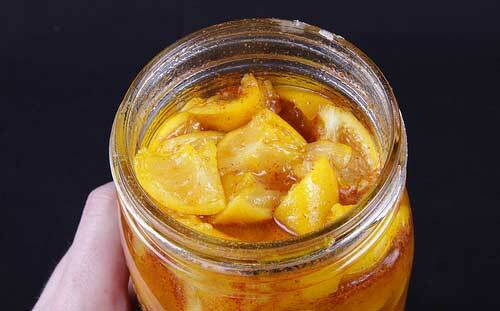 •	Keep the jar until the components become cooked for a week at least or depending on the onion size. •	Use the big tomatoes by cutting it aside and filling it with stuff.